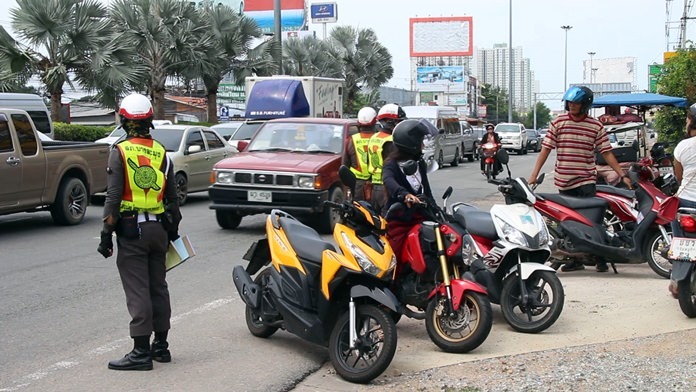 Checkpoints have been established throughout the area to check for drunk drivers, motorcyclists without helmets and drivers without licenses – all of which contribute to Thailand’s appalling highway fatality rate during every Songkran. Songkran is well underway in Thailand and Pattaya police are on the streets trying to keep people alive. Traffic Division Chief Pol. Maj. Orut Sapanon said April 3 that more tourists are expected in Pattaya this year, as 2017’s Thai New Year was muted due to the royal mourning period. As such, traffic police have had to step up their game. On Pattaya’s April 19 wan lai Beach Road, from the roundabout to Walking Street will be closed and vehicles will not be allowed from 6 a.m. to 7 p.m., subject to change. Second Road will be open and all sidestreets will be accessible but blocked off at the Beach Road end. North Road will see its construction halted for wan lai. Orut added that Sukhumvit Road, at the junctions of Pattaya’s main roads, also have police and volunteers stationed to support tourists and residents and the traffic. All stations concerned will consist of medical support, volunteers and police at all times so that help can be provided instantly to those in need.